Genehoa, Jaloffi, et Sierraliones regna 300.7-A-1645-1674?-West Africa Genehoa, Jaloffi, et Sierraliones regna. By Jan Jansson and Johannes Janssonius van Waesberge. From Nuevo Atlas o Teatro de todo el Mundo. Published in Amsterdam by the heirs of Joannis Janssonii in 1664. Opper Ethiopien of Tryk Der Abyssinen 300.4 A-1707 Opper Ethiopien of Tryk Der Abyssinen. By Jeronimo Lobo and Manuel de Almeida. Published in Leyden by Pieter Vander Aa around 1707. Africa: Corrected from Observations of Mess. 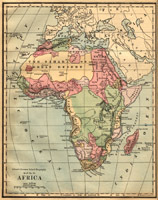 of Ye Royal Societies at London and Paris 300 A-1711 Africa: Corrected from Observations of Mess. of Ye Royal Societies at London and Paris. By Charles Price & John Senex. Published in London by the authors in 1711. Pour L'Intelligence Du Mémoire Sur Les Riviéres De L'Interieur De L'Afrique 300.3 H-1754 Pour l'Intelligence du Mémoire sur les Riviéres de l'Interieur de l'Afrique. By Jean Baptiste d'Anville. From Histoire de l'Académie Royale des Inscriptions et Belles Lettres. Published in Paris by l'Imprimerie Royale in 1759. Africa Upon the Globular Projection 300 A-1763 Africa Upon the Globular Projection. By Eman. Bowen. From General Magazine of the Arts and Sciences. Published in London in 1763. Carte Pour Servir A L'Histoire Philosophique et Politique des Etablissemens et du Commerce des Européens Dans Les Deux Indes 054 A-1780s Carte Pour Servir A L'Histoire Philosophique et Politique des Etablissemens et du Commerce des Européens Dans Les Deux Indes. By Rigobert Bonne. Likely published in the 1780s. Charte von Nieder Guinea und den Angrenzenden Ländern Süd Afrika's 300.1 c-A-1801 Charte von Nieder Guinea und den Angrenzenden Ländern Süd Afrika's: Nach den Neuesten und Besten Hulssmitteln. By Johann Reinecke. Published in 1801. Africa 300 A-1804 Africa. By J. Russell. From Compendious Geographical Dictionary, Containing a Concise Description of the Most Remarkable Places, Ancient and Modern, in Europe, Asia, Africa & America, Interspersed with Historical Anecdotes. Published in London by W. Peacock and Sons in 1804. Africa 300 A-1810 Africa. By Cooper. Published in London by R. Phillips in 1810. Carte Générale de l'Afrique 300 A-1828 Carte Générale de l'Afrique. By Adrien Brue. From Atlas Classique De Geographie Physique, Politique, Ancienne & Moderne. Published in Paris by the author in 1830. 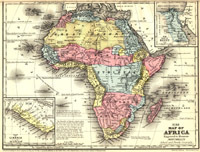 Africa 300 A-1834 Africa. By John Arrowsmith. From London Atlas of Universal Geography, vol. 2. Published in London by J. Arrowsmith in 1834. Africa 300-A-1841 Africa. By Samuel G. Goodrich, George W. Boynton, and Charles D. Strong. From General Atlas of the World. no. 49, published in Boston by C. D. Strong in 1841. Map of Liberia 326 A-1845 Map Map of Liberia Compiled from data on file in the office of the American Colonization Society, under the direction of the Rev. W. McLain, Sec., by R. Coyle. Baltimore: E. Weber & Co., 1845. 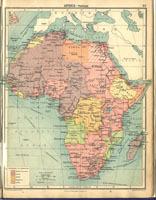 Map of Africa folio G 1019 .M67 1867 Map of Africa. In Mitchell's school atlas : comprising the maps and tables designed to accompany Mitchell's school and family geography. Philadelphia: E.H.Butler and Co.,1866, c1865. Africa G 125.C72 1876 Africa. In Colton's common school geography/by J. H. Colton. New York: Sheldon. 1875. Afrique AE 25.G7 Afrique. In La Grande encyclopédie, inventaire raisonné des sciences, des lettres et des arts, par une société de savants et de gens de lettres; sous la direction de mm. Berthelot...Hartwig Derenbourg [etc.]. Paris, Lamirault et cie. 1886-1902. 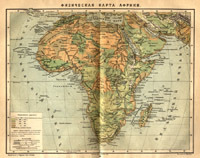 Физическая Карта Африки [Physical Map of Africa] AE 55.E6 v.2 Физическая Карта Африки. In Entsiklopedicheskii slovar, pod redaktsiei professora I. F. Andreevskago. Tom I-XLIA ... Izdateli: F. A. Brokgauz (Leiptsig) I. A. Efron. S.-Peterburg.1890-1904. 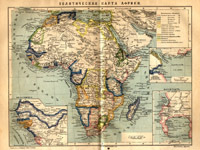 Политическая Карта Африки [Political Map of Africa] AE 55.E6 v.2 Политическая Карта Африки [Political Map of Africa]. In Entsiklopedicheskii slovar, pod redaktsiei professora I. F. Andreevskago. Tom I-XLIA ... Izdateli: F. A. Brokgauz (Leiptsig) I. A. Efron. S.-Peterburg.1890-1904. 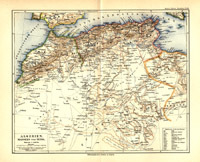 Algerien, Marokko und Tunis G 1019.M4 1892 Algerien, Marokko und Tunis. In Meyers kleiner Hand-Atlas. Mit Benutzung der Kartenmaterials aus Meyers Konversations-Lexikon zusammenstellt in 100 Kartenblättern und 9 Textbeilagen. Leipzig: Verlag des Bibliographischen Instituts. 1892. Ober-Guinea und West-Sudan G 1019.M4 1892 Ober-Guinea und West-Sudan.In Meyers Kleiner Hand-Atlas. Mit Benutzung der Kartenmaterials aus Meyers Konversations-Lexikon zusammenstellt in 100 Kartenblättern und 9 Textbeilagen. Leipzig: Verlag des Bibliographischen Instituts. 1892. Aquatorial-Afrika G 1019.M4 1892 Aquatorial-Afrika.In Meyers Kleiner Hand-Atlas. Mit Benutzung der Kartenmaterials aus Meyers Konversations-Lexikon zusammenstellt in 100 Kartenblättern und 9 Textbeilagen. Leipzig: Verlag des Bibliographischen Instituts. 1892. 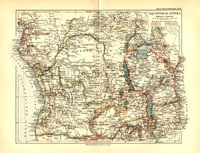 Carte Generale de l'Afrique: Voir, a leur orde alphabetique, les cartes detaillees des divers pays AE 25.L35 Carte Generale de l'Afrique: Voir, a leur orde alphabetique, les cartes detaillees des divers pays. In Nouveau Larousse Illustré; Dictionnaire universel encyclopédique, publié sous la direction de Claude Augé. Paris, Librairie Larousse. 1898-1904. Modern Africa G 2445.B3 Modern Africa. 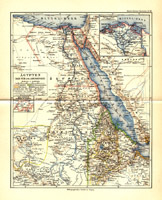 In literary and historical atlas of Africa and Australasia, by J. G. Bartholomew, LL.D. London: J. M. Dent & Sons Ltd; New York: E. P. Dutton & Co. Inc. 1913. Africa Population G 2445.B3 Africa Population. 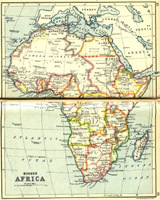 In A literary and historical atlas of Africa and Australasia. by J. G. Bartholomew, LL.D. London: J. M. Dent & Sons Ltd; New York: E. P. Dutton & Co. Inc. 1913. Africa Religions & Missions G 2445.B3 Africa Religions & Missions. 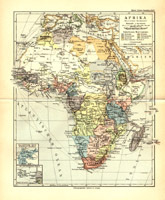 In A literary and historical atlas of Africa and Australasia. by J. G. Bartholomew, LL.D. London: J. M. Dent & Sons Ltd; New York: E. P. Dutton & Co. Inc. 1913. Africa - Political folio G 1019 .B44 1922 Africa- Political. In The comparative atlas of physical and political geography, founded by the late J.G.Bartholomew. London, Meiklejohn & Son. 1922.